Let us help you design the engagement ring of your dreams. We specialize in custom engagement rings and wedding bands and can set your ring with diamonds - natural or lab grown, as well as diamond alternatives such as Moissanite. Our jewellery store is located in Hamilton ON. Serving Burlington, Oakville, Mississauga, Toronto, Niagara, and beyond. Whether you’re looking for conventional and classic wedding band styles or a contemporary, unique and creative engagement ring design, be sure to contact Maja at Zoran Designs Jewellery in Hamilton, ON. **Please call or email to make an appointment with Maja for your in-store consultation. Browse our portfolio of recently completed made-to-order and custom engagement rings or continue below to learn more. We can help you find the perfect diamond for your engagement ring. Just tell us your desired specifications and budget! We source quality certified diamonds, Canadian diamonds and lab grown diamonds. Our diamonds are ethically sourced and conflict free. At Zoran Designs Jewellery the engagement rings are made to order for you. This means that you can customize your ring to your liking. Our engagement rings can be cast in the traditional precious metals and your diamond will be supplied in accordance with your specifications or budget. Custom design requests for your engagement ring are welcome. We invite you to contact us if you would like to discuss your options further or obtain an estimate. 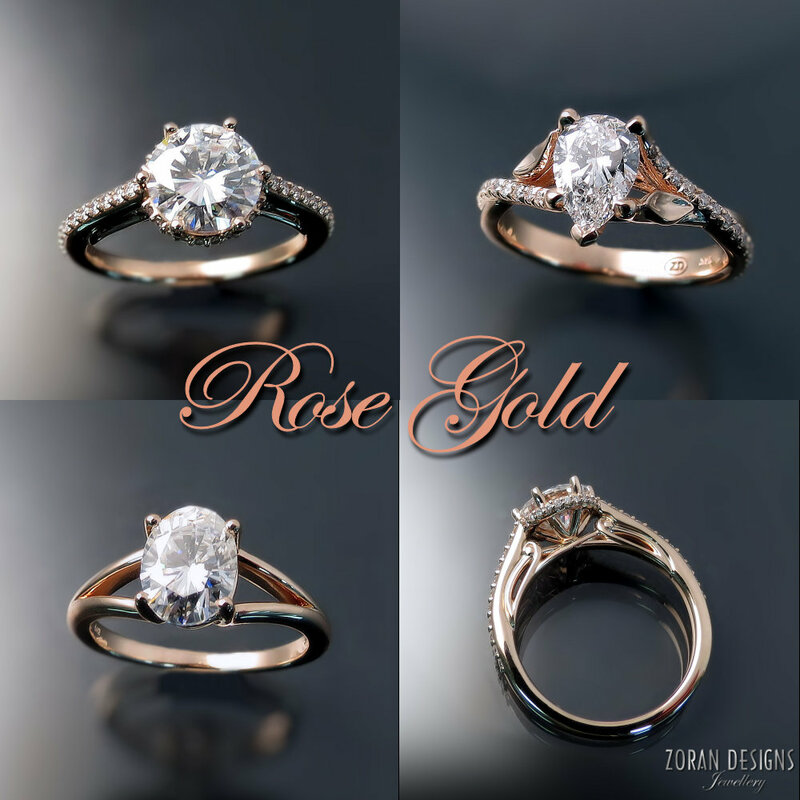 Get your engagement ring custom designed at Zoran Designs Jewellery for a truly unique and one-of-a-kind ring she will treasure for life. Through customization and custom design we can give you the opportunity to realize your dream engagement ring. Furthermore, we will gladly incorporate stones from family heirloom pieces to make it extra special. This engagement ring was commissioned by a client wishing to incorporate rubies from a ring inherited from a grandparent. Old and new came together beautifully in this contemporary custom made engagement ring. "Hi Maja, Martha loves the ring… so do I. It is so beautiful on her hand. Your support and guidance for us is greatly appreciated. We often comment to those who admire the ring about how well we felt treated by you and how pleased we are with your depth of knowledge. When we arrived home that night I temporarily put the wedding band on her so that Martha could see it with the engagement ring. That way she didn’t have to wait until spring to appreciate it’s combined beauty. You are still on our agenda for my wedding band." Custom engagement ring. See it sparkle. If you have existing jewellery or loose stones we'll be happy to redesign, restyle, remodel and reset into a fresh new design. TWO BECOME ONE - Diamonds from two older rings were removed and reused to create this stunning custom designed engagement ring. Your wedding rings are a symbol of the meaningful vows you exchange when you get married. They should reflect your personality and suit your lifestyle. Whether you're looking for a simple gold band, a wedding ring set with diamonds or something more unique, Zoran Designs Jewellery will help make sure you end up with your ideal wedding bands. If you are interested in custom one-of-a-kind wedding bands that are unique to you and your partner we will be happy to discuss your ideas and preferences. Matching HIS & HERS custom wedding bands in two tone gold with Celtic knot design. More examples of custom wedding bands by Zoran Designs. If you have an engagement ring that does not sit well with any ready-to-wear wedding bands you’ve tried on, come to Zoran Designs Jewellery where we can custom make a contoured wedding band that is sure to suit the design and sit just right next to your engagement ring. Vintage style diamond wedding band custom made to compliment antique emerald engagement ring. Here are a few more examples of wedding bands custom made to sit perfectly next to uniquely shaped engagement rings. Diamond alternatives for your engagement ring are always an option at Zoran Designs Jewellery. Moissanite is ideal if you like the sparkle and colourless look of diamonds but for reasons of cost or ethics prefer an alternative gem. Because it is similar in appearance to a diamond and just one step below it on the hardness scale, Moissanite is a beautiful and durable stone that costs a fraction of the price of a diamond and does not require you to compromise on appearance or longevity. Zoran Designs Jewellery is your source for Charles and Colvard created Moissanite. Although we do not stock loose Moissanite stones, we do have a few already set in engagement rings and available for viewing. If you are located within the GTA, drop by our store to see the striking fire and brilliance of this beautiful lab grown gem in real life. You will understand why it is such a popular diamond alternative. If you're considering a Moissanite engagement ring and searching for a Toronto area jeweller who works with it, contact us today. If colour is what you like for your engagement ring we recommend coloured diamonds, rubies or sapphires which come in a multitude of colours and shades and will stand the test of time. Consider lab created versions if you're on a tight budget. Sapphires are an excellent option for engagement rings. They are durable and come in a variety of colours. LET US HELP YOU MAKE YOUR DREAM ENGAGEMENT RING A REALITY. Start the process today! Call us at 1-905-522-2214 or use this form to send us your inquiry and set up a FREE consultation.